Who Staff of the Oberkommando der Wehrmacht (OKW) (English: Supreme Command of the Armed Forces), Army Group A under Field Marshal Gerd von Rundstedt (1875–1895), and Army Group C under Field Marshal Wilhelm von Leeb (1876–1956). Plans called for an amphibious landing with around 67,000 men in the first echelon and an airborne division to support them. Why Britain’s ally France officially surrendered to Hitler’s invading forces on June 22, 1940, in the full glare of German media in the same railroad car where Kaiser Wilhelm II’s representatives had signed the World War I surrender document 21 years before. 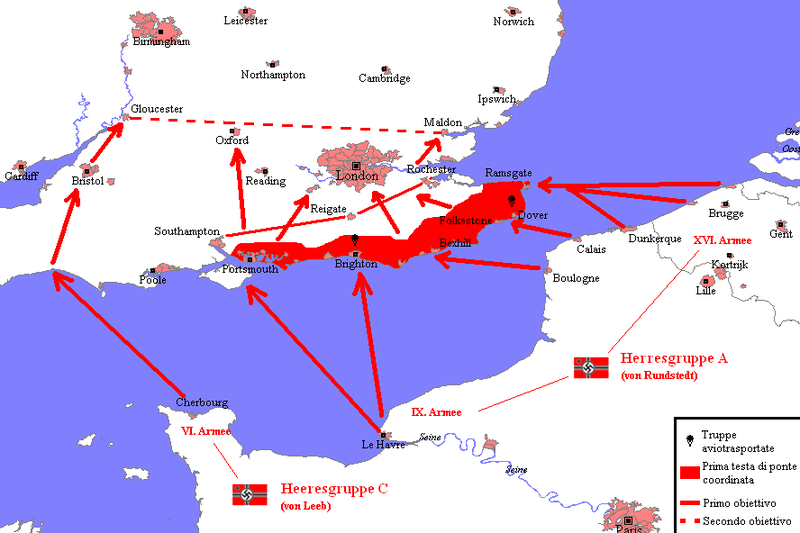 The refusal of Britain to negotiate an end to European hostilities prompted Hitler to plan for an airborne and amphibious invasion of England to eliminate that country’s ability to interfere with German military and political hegemony in Europe. What On July 16, 1940, Hitler issued Fuehrer Directive 16, setting in motion preparations for Operation Sea Lion (Unternehmen Seeloewe). In harbors up and down France’s Pas de Calais and north­ward along the coast of the Low Coun­tries the Germans began assembling an armada of barges and other trans­port craft for a cross-Channel inva­sion of England. Sea Lion called for six coor­di­nated landings along a hun­dred miles of England’s south coast, backed by an air­borne assault. But to have had any chance of success, the oper­a­tion would have required air and naval supre­macy over the English Chan­nel. The Royal Navy alone had over a thou­sand war­ships, many of which patrolled the Chan­nel, and behind them were squad­rons of destroyers, cruisers, and battle­ships ready to spring into action. Col.-Gen. Alfred Jodl, Chief of Oper­a­tions in the OKW; Grand Admiral Erich Raeder, commander-in-chief of the Kriegs­marine; and Air Marshal Hermann Goering expressed reser­va­tions at one time or other as to whether Germany would every have mastery over the English Channel or in English skies. With the Luft­waffe’s inability to deliver a knock­out punch to the Royal Air Force during the Battle of Britain (June–September 1940), Sea Lion was postponed indefinitely on September 17, 1940. Outcome Had Operation Sea Lion succeeded, Britain and Ireland would have been divided into six military-economic commands. Over 2,800 people would have been arrested immediately, and the occupation authorities would begin liquidating Britain’s Jewish population, which numbered over 300,000. The able-bodied male population between the ages of 17 and 45 would for the most part be interned and dispatched to the Continent. This represented about 25% of the British population. Britain was then to be plundered for anything of financial, military, industrial, or cultural value. Following Hitler’s postponement of the invasion, a palpable sense of relief swept over the Wehrmacht. Army Group A commander Field Marshal Gerd von Rundstedt took this view. Sea Lion was resched­uled for some time the next year but it was not until February 13, 1942, long after Operation Barbarossa had been unleashed on the Soviet Union, that forces earmarked for the Sea Lion were released to other duties.